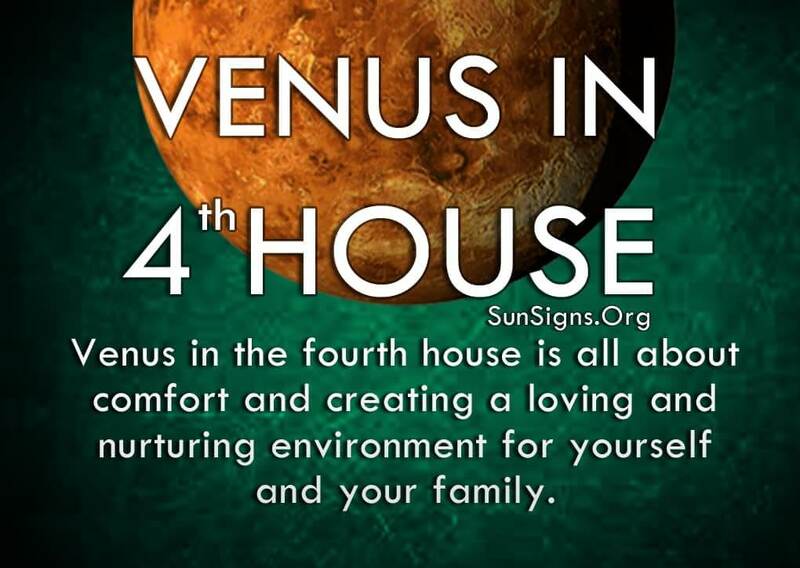 Venus in the fourth house is all about comfort and creating a loving and nurturing environment for yourself and your family. Tradition is very important, just like family values and the moral fiber of your loved ones. You pay attention to maintaining peace and harmony within your tight social circle. While Venus generally represents romance, it also symbolizes having fun and doing things we enjoy the most. For the fourth house, you feel at your best when you’re playing host or hostess. You love having people over, enjoying the comforts of your home, and complimenting you on your wonderfully decorated space. With Venus in the fourth house, your focus is on family – past, present, and future. You look back at where you came from and view your childhood in a very sentimental fashion. This can color your perception of your current family situation, whether it’s your parents and relationship with siblings or the family you have with a partner. Because of your emotional state, you can react to things in a melodramatic manner and push away those closest to you while trying to figure out the best way to fix the situation. (After all the Moon is the ruling planet and Cancer is the ruling zodiac sign). But keeping those involved out of your process never helps, and can add more drama into the mix. Let go of conservative thinking once in a while and you may find a fresh perspective. You tend to smother your loved ones with your need to facilitate a certain outcome, when a more natural approach may be the way to go. Venus in 4th house astrology predicts that the one thing that upsets you greatly is when others don’t appreciate your efforts as much as you do. But you hold in your anger or frustration, and use it to manipulate the situation when it suits your needs. This kind of passive-aggressive behavior can be a problem, especially when others find out what you’re doing. You are a very emotional person, and often give yourself away because you can never truly hide your real emotions. But because you so desperately want to restore harmony to the world you’ve created, people often forgive you of your lesser transgressions. You’re never trying to hurt anyone intentionally, and your reasons for the manipulation are somewhat pure. But you have to be aware that your need for control can prevent you from being able to have any influence on what’s happening. People can become resentful toward your “good intentions” even if they came from a place of love or concern. Instead of trying to get things to go your way, use your incredible psychic powers to figure out what’s going on and how you can play a part in the success. You will find a role that suits your skill set without getting in the way of other people involved. You take great pride in creating a place where people can relax and unwind, for you want the same thing. Chaotic or messy situations just aren’t for you. You enjoy the calm and the quiet of a cozy environment. You add the lovely finishing touches to any project and take great care in maintaining your creations. Read more about Venus symbolism in astrology. It’s because you are such a giving person, willing to do anything to help, that makes you want to set things straight. Just make sure you’re doing it for the good of the family, not just your peace of mind.